This montage of images from the NASA Cassini and Voyager missions shows that structural evolution has occurred in Saturn's D ring (the innermost ring) during the quarter century separating the two missions. The inset image reveals structure with an unprecedented level of fine detail. The lower panel was taken in 1980 by Voyager 1 from a distance of about 250,000 kilometers (155,000 miles). The bright material at the lower left is the inner edge of the C-ring. Interior to this feature, we see three discrete ringlets. From right to left, these are called D73, D72 and D68, respectively. The upper panel, obtained by Cassini from a distance of 272,000 kilometers (169,000 miles) on May 3, 2005, shows the same region from a similar viewing geometry. 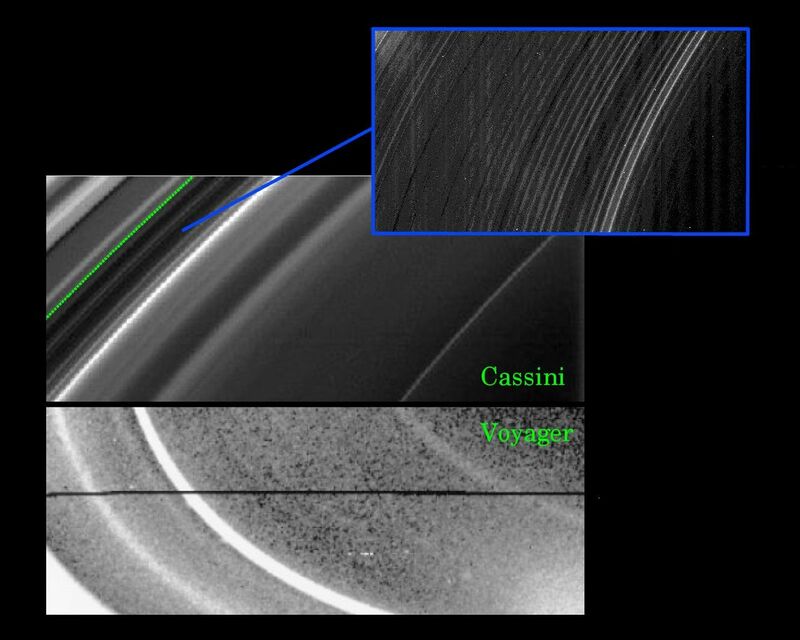 The green line marks the edge of the C-ring, which was not overexposed like the Voyager image. Image scale in this Cassini view is about 13 kilometers (8 miles). There have been some very significant changes in the appearance of the D ring since observed by Voyager. The most dramatic changes involve D72, which was the brightest feature in the D-ring 25 years ago. Since then, D72 has decreased in brightness by more than an order of magnitude relative to the other ringlets. It also has moved inward about 200 kilometers (125 miles) relative to the other features in the D ring. 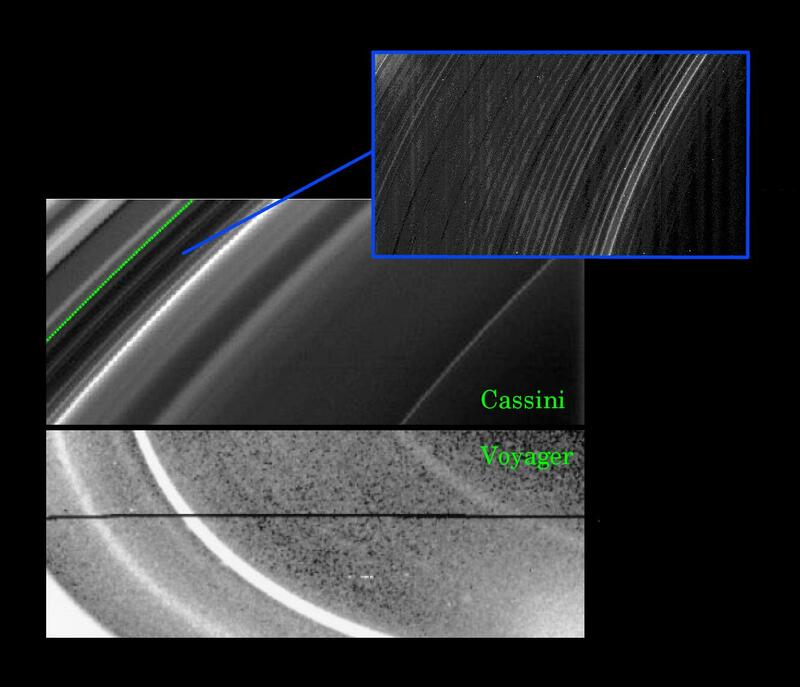 Cassini has also observed the D-ring at much higher resolution than was possible for Voyager, revealing surprising fine-scale structures. The inset narrow-angle camera image (upper right) was taken on May 21, 2005, in a very different geometry from the larger scale Cassini panel to its left. This close-up shows the region between D73 and the C-ring at 2 kilometer (1 mile) per pixel resolution. This region contains a periodic wave-like structure with a wavelength of 30 kilometers (19 miles). The faint vertical bands in the image are instrumental artifacts. 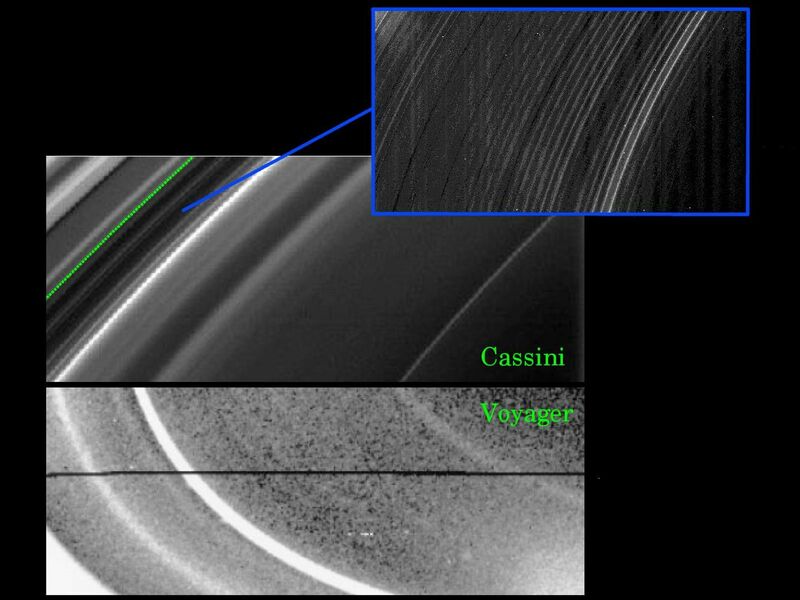 As for the significance of these findings, the time-variability of the rings over only decades can provide information about how the rings are maintained and confined, and how long they last. The fine structure in the D-ring (visible in the inset) could be related to perturbations from the planet or its magnetic field. 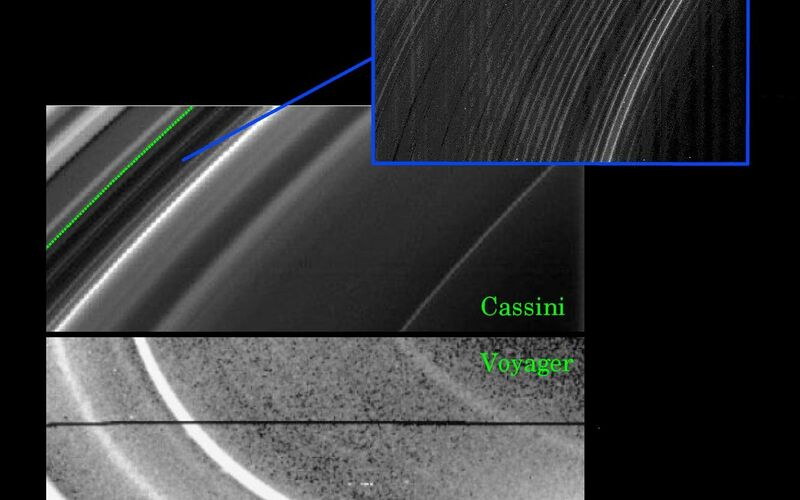 The Cassini results provide information about the dynamics of ring particles in a new regime -- one very close to the planet and sparsely populated by icy particles the size of dust. The Cassini-Huygens mission is a cooperative project of NASA, the European Space Agency and the Italian Space Agency. The Jet Propulsion Laboratory, a division of the California Institute of Technology in Pasadena, manages the mission for NASA's Science Mission Directorate, Washington, D.C. The Cassini orbiter was designed, developed and assembled at JPL.